Description: This is an abstract for the Gradebook Secondary Checkup report, which shows the students grades for a selected grading period for their entire schedule. 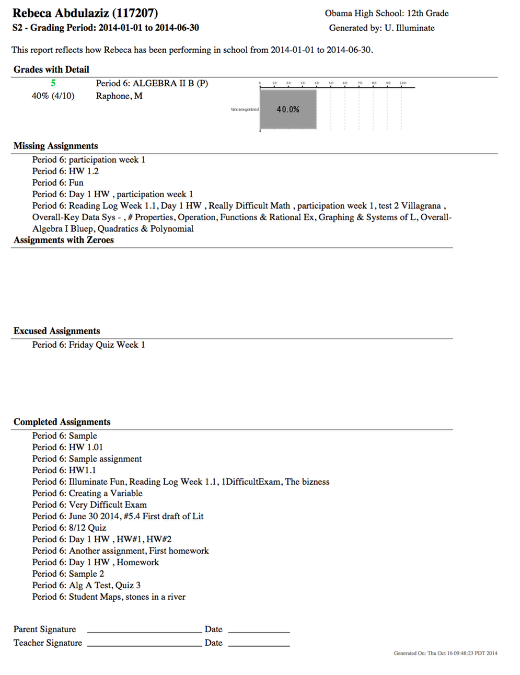 Purpose: A single report to show a student’s current gradebook grades for a particular grading period, category scores, and missing/zeroes/excused assignments. The Secondary GradeBook Checkup Report provides a report for students with their schedule and current grade mark and percent in each period. You can opt to include the number of points earned, color or black and white print, a summary chart for categories, student name and/or ID, and a parent signature line. All students are given a separate report, with the option to include a chart displaying their category scores for each period. A user with visibility to a student will be able to see and print all grades for that student.